According to Manetho, the 6th Dynasty kings came from Memphis, a statement which seems to be borne out by the location of their funeral monuments at Saqqara, overlooking the capital of Memphis. Teti's accession to the throne as the first king of the new dynasty seems to have resolved the monarchical and political instability in Egypt which followed the death of Unas. By marrying one of Unas' daughters, Iput, he legitimized his right to rule; and by adopting the Horus name Seheteptawy ('He who pacifies the Two Lands'), he symbolized renewed political unity in the country. He also sought the good will of the increasingly powerful nobility and provincial elites by marrying his daughter Seshseshet to the vizier Mereruka (whose mastaba tomb close by Teti's pyramid is the best-known monument of the reign). The surviving manuscripts of Manetho's work all record that Teti (sometimes known as Othoes) was murdered by his bodyguard. There is no direct evidence, although a violent death may help to explain references to another king, Userlcare, who may have reigned briefly between Teti and his son Pepi I. 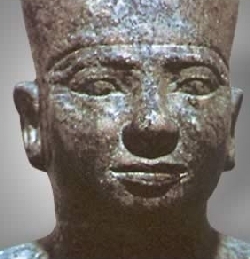 At any rate, Teti seems to have reigned for about12 years, during which he continued to trade with Byblos and Nubia. Sistrum inscribed with the name of Teti. There is relatively little to show for Teti's reign nowadays except for the once finely cased but now rubble mound of his pyramid towards the northern edge of the Saqqara plateau. As usual, the entrance is on the north side and leads to a much damaged burial chamber inscribed with excerpts from the Pyramid Texts and still with its lidless basalt sarcophagus. A wooden coffin found in 1881 is in the Cairo Museum. Although there are the remains of a mortuary temple on the east face, the causeway leading to it from the valley temple has vanished and the valley temple itself has never been found. To the north of the pyramid lie the sand-covered smaller pyramids of two of Teti's queens, Iput and Kawit. Iput was the mother of the next king, Pepi I, and her skeleton was found in a wooden coffin in her pyramid (although many of the other items therein had been robbed).